Parties are getting more and more sophisticated. Back in our days it was kids coming over and eating cake and sweets while watching a video and playing. These days parents are pulling out all the stops to make a child's birthday party a memorable one and with two kids, a boy and a girl, we've been to everything. Movies, ice skating, trampoline park, pool parties, supertube, survival parties and more. But Drama Princess had a first the other day. 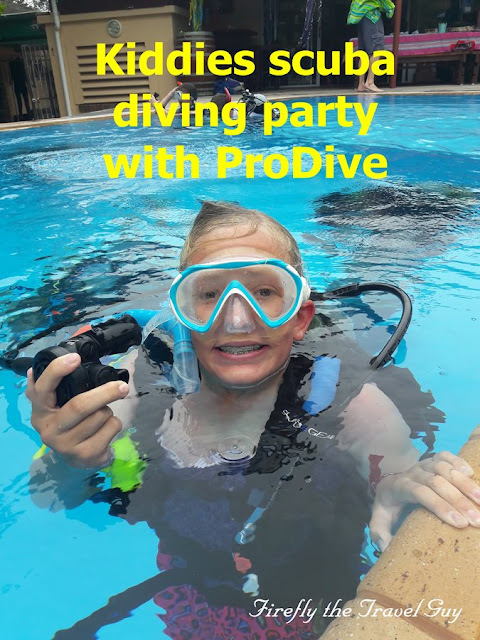 A scuba diving party hosted at ProDive here in Port Elizabeth. The kids had a swim in the dive pool while waiting for everybody to arrive before the full safety briefing by one of ProDive's qualified dive masters. 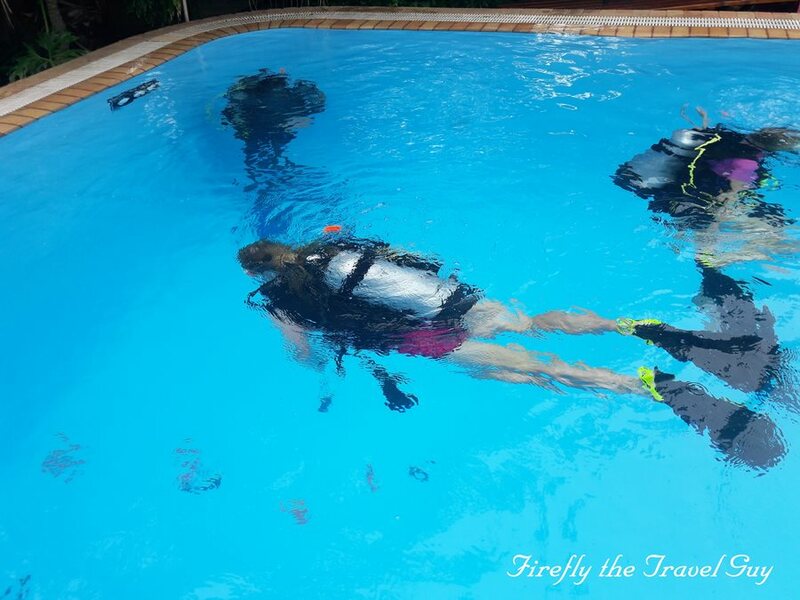 ... with the dive master kitting them each out individually to make sure everything is in order. Then it was time to get in the water and the fun to start. 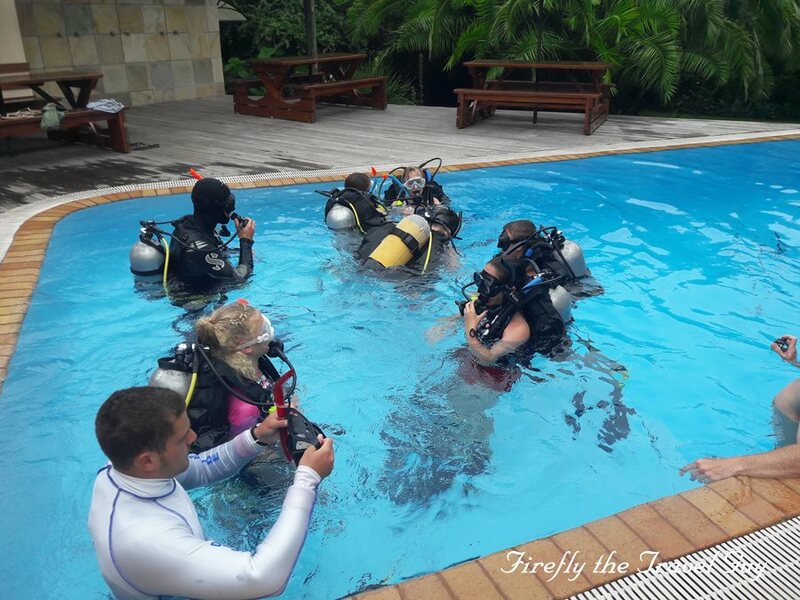 Miggie showing off her scuba look. ... while Miggie's mind told her she has to come up every time she wanted to breathe in. 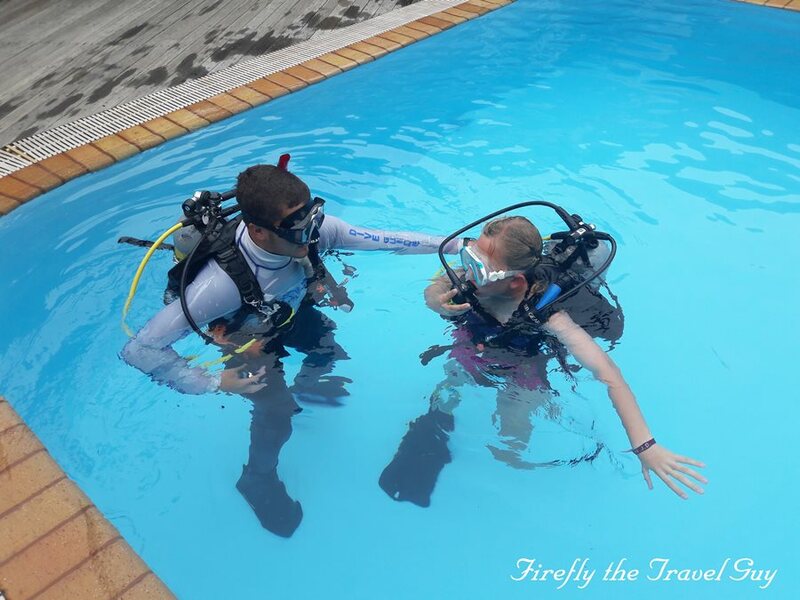 The dive master brought her back to the shallow side and spent a few moments with her to put her mind at ease and to help her get used to breathing underwater. Then there was no stopping her. 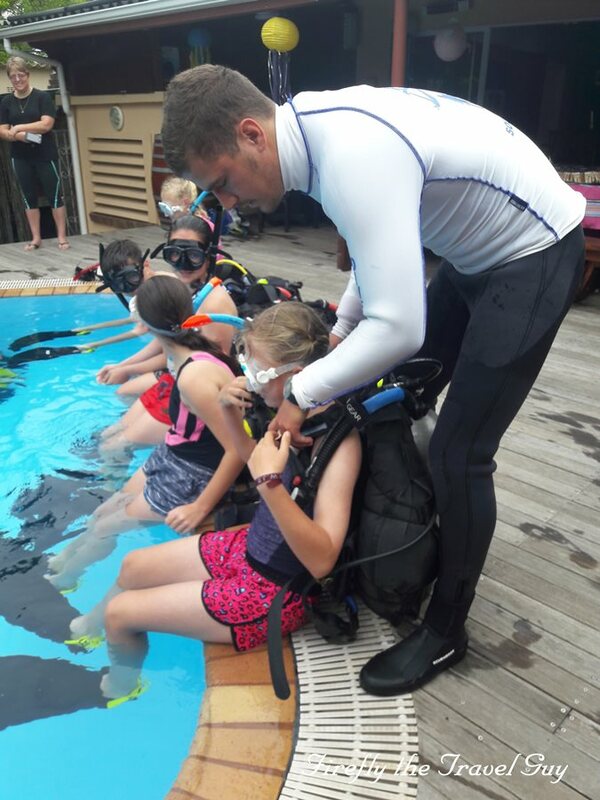 I wondered beforehand if Miggie would enjoy a scuba party and if she would even go under water. Any uncertainty was cleared up very quickly and the kids at the party absolutely loved it and would have spent all day in there if they could. I did my diving qualification many years ago and haven't dived for a while, but I remember the feeling and I can imagine while the kids loved it. 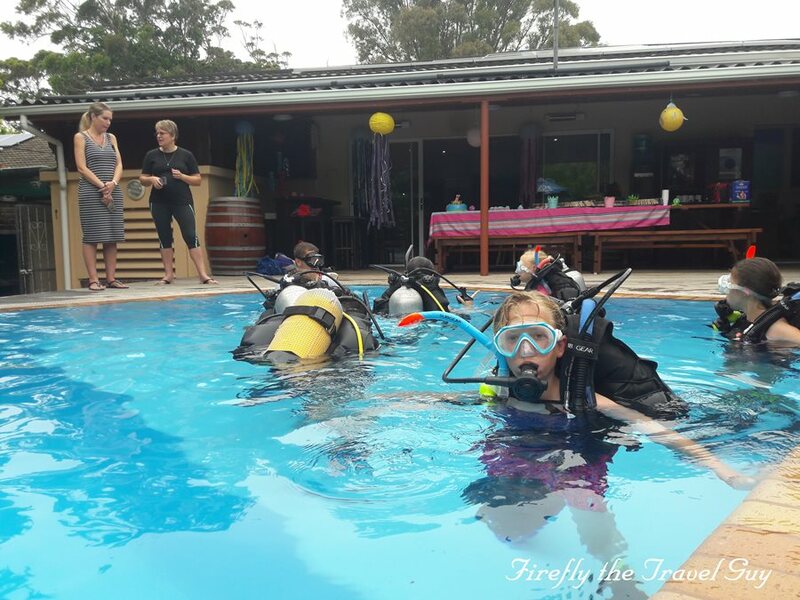 It's really something different and if you're looking for something out of the ordinary for your child's next party, then you should really consider doing this. The Hole in the Wall near Coffee Bay on the Wild Coast truly is one of the iconic sights (and sites) of the Eastern Cape and South Africa and recognised worldwide. 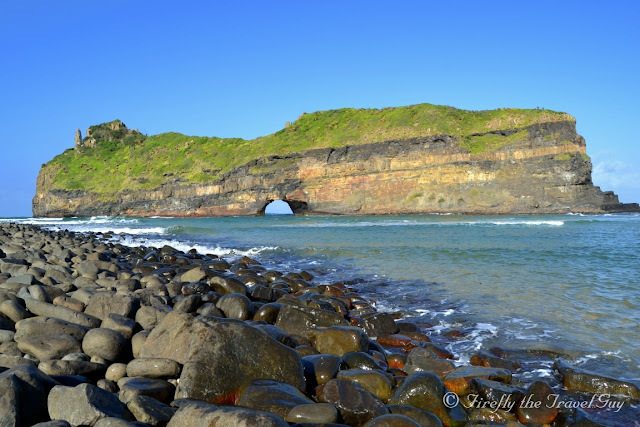 Hole-in-the-Wall was named by Captain Vidal in 1823. Vidal was captain of the Barracouta and was sent by the British to survey the coastline between the Keiskamma River and Lourenço Marques (present-day Maputo). 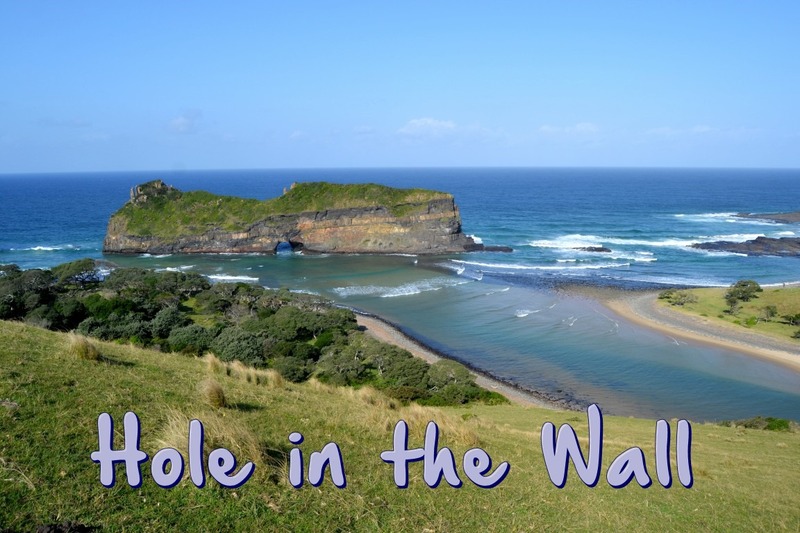 He took his ship as close as 800m from the coast and described the phenomenon of a natural archway which he then named the "Hole-in-the-Wall". The local Bomvana people refers to the formation as ‘EsiKhaleni’, the Place of the Sound or Place of Thunder. During certain seasons and water conditions, the waves clap in such a fashion that the concussion can be heard throughout the valley. Local legend tells that the Mpako River once formed a landlocked lagoon as its access to the sea was blocked by a mighty cliff. A beautiful girl lived in a village near the lagoon. One day she was seen by one of the sea people who became overwhelmed by her beauty and tried to woo her. The sea people were semi-deities who look like humans but have supple wrists and ankles and flipper-like hands and feet. When the girl’s father found out he forbade her to see her lover. So at high tide one night, the sea people came to the cliff and, with the help of a huge fish, rammed a hole through the centre of the cliff. As they swam into the lagoon they shouted and sang, causing the villagers to hide in fear. In the commotion the girl and her lover were reunited and disappeared into the sea. 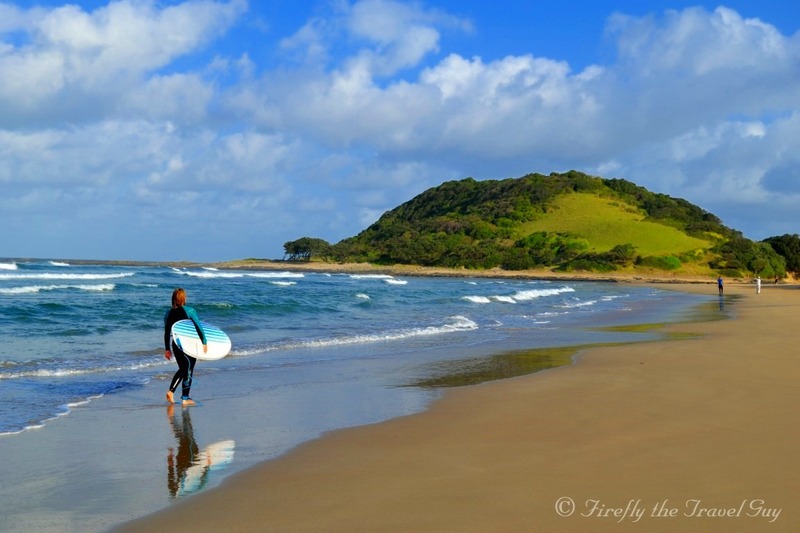 At the bottom of the beach in Coffee Bay is Bomvu Hill offering stunning views of both Coffee Bay to the north side and Bomvu Bay to the south. The village is located to the left just out of the picture next to the Nenga River. Looking at the Coffee Bay view the white building at the top of the beach is the Ocean View Hotel where I have now stayed twice already. 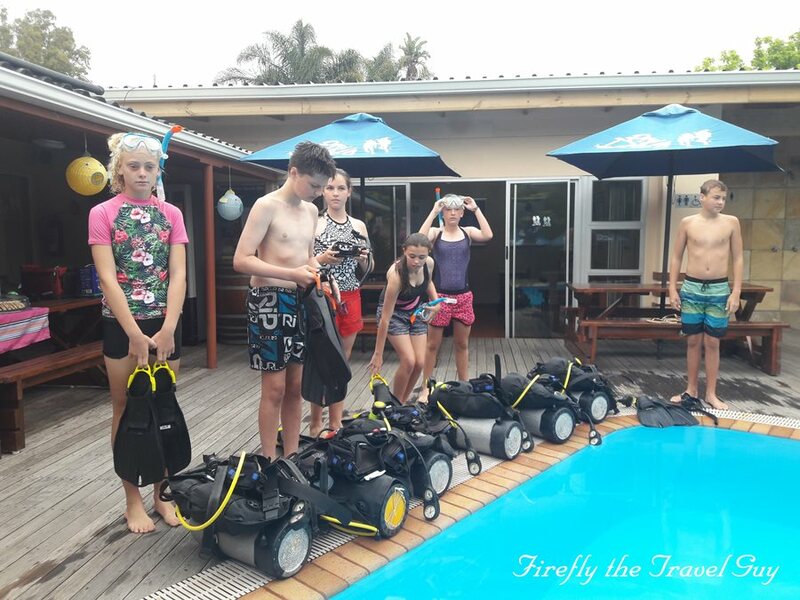 Comfortable accommodation, great dinner buffet, direct access to the beach and they offer tours to Hole in the Wall. I haven't had a chance to stay at one of the backpackers in Coffee Bay yet but would love to experience that side and vibe of it as well, but if you're looking for hotel accommodation in Coffee Bay then Ocean View is the way to go. Looking south Hole in the Wall is about 7 or 8 kilometres down the coast. Coffee Shack Backpackers is located just on the other side of the rocky beach below. To the left-hand side of the hill is virtually a sheer drop down to the Indian Ocean below. Next time I visit Coffee Bay I want to do a surf lesson. Time for me to try something new. One of my absolute travel highlights during 2017 is the fact that I finally got to visit the Hole in the Wall near Coffee Bay on the Wild Coast. It was somewhat of an embarrassment to be somebody promoting and marketing the Eastern Cape but having to say that I have never been there. It's not the closest destination to where I live in Port Elizabeth though so it's not like I could just pop up to go and see it. 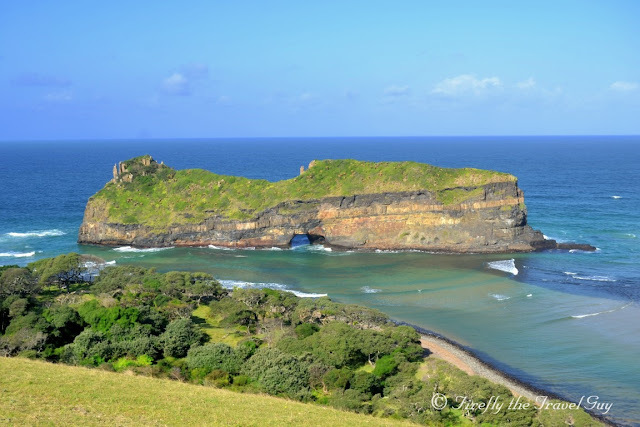 About two years ago I was in Coffee Bay en route to Durban and wanted to go, but circumstances led to me not being able to. It means that this time around there was no way I was going to miss it again. Non at all. Coffee Bay is a good 6 1/2 hour drive from Port Elizabeth and knowing that I left PE early to give myself enough time to see one of South Africa's iconic geological attractions. 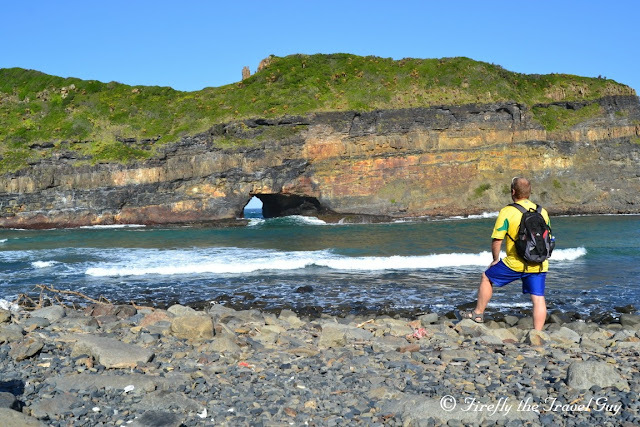 After checking in at the hotel in Coffee Bay and declining the invitation of gin and tonics from a few travel colleagues who had arrived already, I headed the 8 km or so down the coast towards Hole in the Wall. There are two options to view "the wall". One from the hill above and the second from the rocky beach. I opted for the former first and followed the track up the hill. What a sight! After taking in as much from the viewpoint as I could I headed down to the bottom. 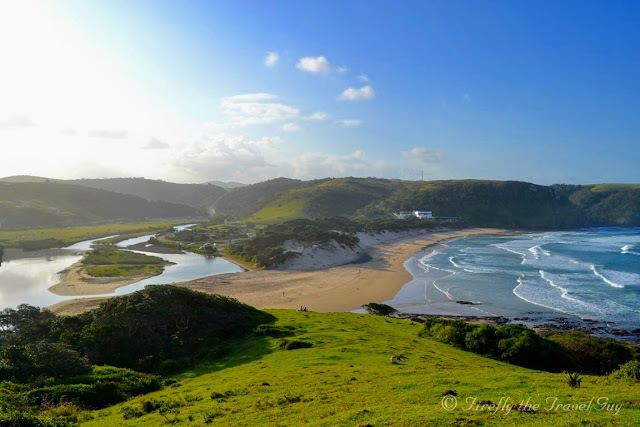 Rather than leaving my car at the normal parking spot and allowing myself to be harassed by the "informal guides", I wangled my way into the grounds of the Hole in the Wall Hotel and after a chat to the GM made my way out the gate and along the path to find myself face to face with this Wild Coast icon. I literally felt like I could spend all day here and if I had brought a towel and lunch I may well have done just that. Finally I can tick one of the big things off my South African travel bucket list. I have always wanted to make travel videos. When I started working as a tourist guide in 1998 I had a little video camera which I filmed my tours with. Back then I didn't know anything about editing. The video was basically what I shot and I had to make sure the video was rewound just far enough for the next shot to start where I wanted it to. All those videos are somewhere on VHS tapes in a cupboard at home. Somewhere I kinda lost the whole video thing and started enjoying photography and blogging. 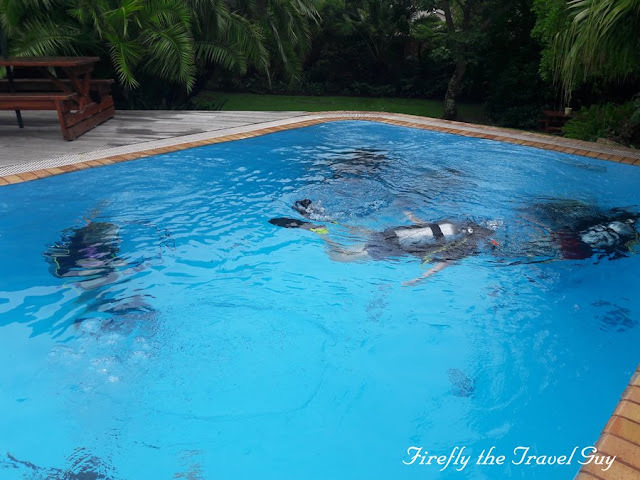 But as a blogger I started to feel like I'm falling further and further behind many other travel bloggers who started including more video on their social media platforms. A few weeks ago we headed out to the Tsitsikamma for a day and I decided that it was time to give video a go again. Rather than go out and take photos all day, I took video clips on my DSLR camera and on returning downloaded a very easy to use video editing program. This week I finally had a chance to play around with it and once I started I couldn't stop. I realise that with the DSLR obviously not having an anti-shake like a video camera has I should probably have used a tripod, but I live and learn. I must say that I was quite impressed with the end result. Obviously, I still have a lot to learn, but you can definitely be sure that you will be seeing a lot more video from me in future. So here it is, my first video called A day in the Tsitsikamma. What do you think? The Karoo Heartland has a unique beauty which I have really learned to appreciate more and more as I have gotten older. If you're a forest or beach person then the Karoo may not be for you, but if big skies and open spaces feed your soul then there is no better place. One of my favorite Eastern Cape Karoo Heartland landmarks is the Koffiebus and Teebus mountains outside Steynsburg. Although there are many similar Karoo koppies throughout the whole region, the fact that there is a thick one (the coffee pot) and a thin one (the teapot) next to each other like this is quite noticeable. I was in East London a couple of weeks ago and noticed the neighbourhood watch board on the guesthouse gate. Neighbourhood watch groups do an amazing job getting residents together and curbing crime in residential areas and I live in a suburb with a very active neighbourhood watch. 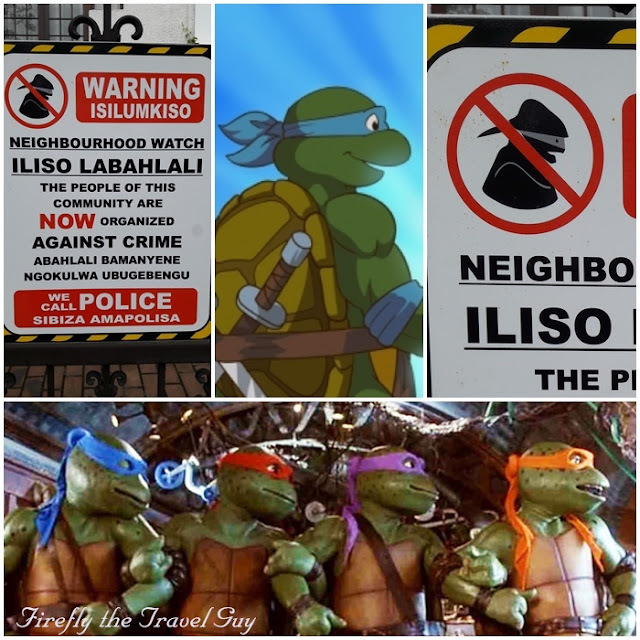 Looking at this board though I thought to myself that we're very lucky in our area not to have a Ninja Turtle problem like they do in East London. Being from the Eastern Cape we all know that there are areas where you have to be very careful driving at night. Unlike our friends in the Big Smoke it's not robbers and highjackers we have to be careful of, but rather Kudus. These big antelope jump fences up to 2 meters tall and come and browse on the side of the road after dark, often jumping into the road and colliding with cars when they get startled by the bright lights. 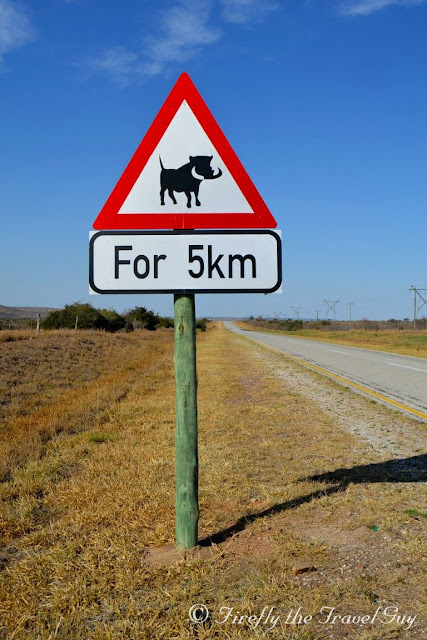 Because of this Kudu warning road signs is a regular sight on the roads of the Karoo Heartland. But lately, a new sign has stuck its head out. 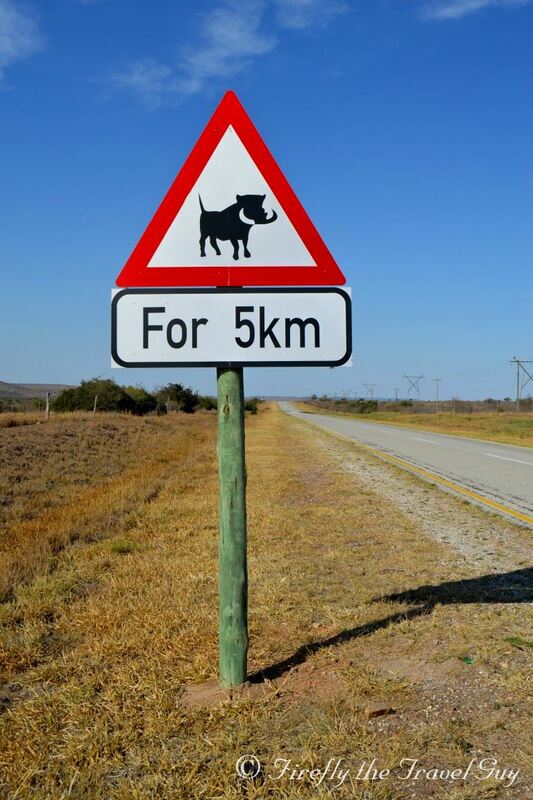 A Warthog warning sign. Now warthogs don't jump fences, for that their legs are way too short. But they do burrow underneath and they can often be seen on the side of the R75 road towards Graaff-Reinet from Port Elizabeth. Hence, Beware of Warthog signs. 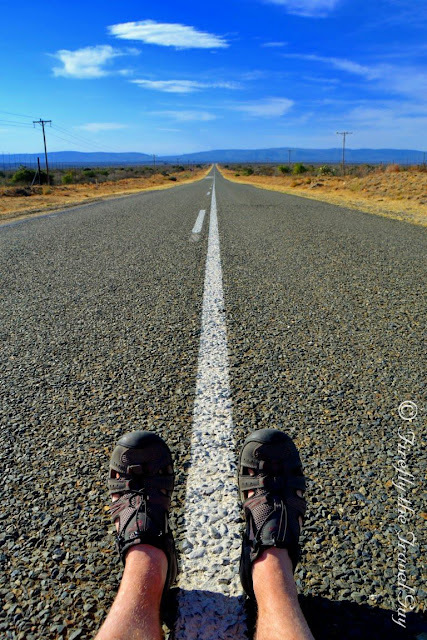 When I downloaded this photo of me sitting in the road near Jansenville in the Karoo Heartland from my camera onto the laptop and saw it, the first thing that came to my mind was "The road is long..." from He ain't heavy, he's my brother by The Hollies. The tune, melody, words, everything. It's probably also the best description of my life lately. Between work and personal life it's been busy, busy, busy with lots of time spent on the road and driving my desk when I'm not, catching up on admin. I wouldn't have it any other way though because I love what I do, but in the process blogging was the one thing that was left on the luke hot back burner. There just hasn't been much for blogging and I really need to make a plan to change that. But a journey of a thousand miles starts with a single step and the only way to eat an elephant is one bite at a time. 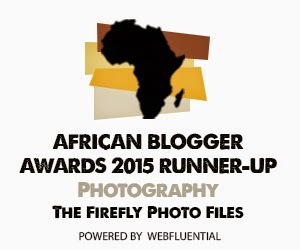 So at one stage or another, I need to get back into blogging and this is as good a time as any. 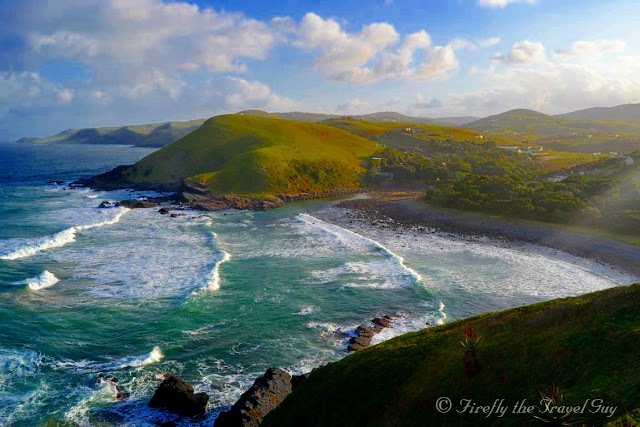 I posted for the first time in over six weeks on Port Elizabeth Daily Photo earlier this week and its time to get Firefly the Travel Guy going again after this break. So, "The road is long, With many a winding turn..."
No visit to Graaff-Reinet will be complete without a visit to the Valley of Desolation yet I wonder how many people actually realise that the Valley of Desolation is located within the Camdeboo National Park, which actually reaches all the way around the town, and that you can also go game viewing in the park. 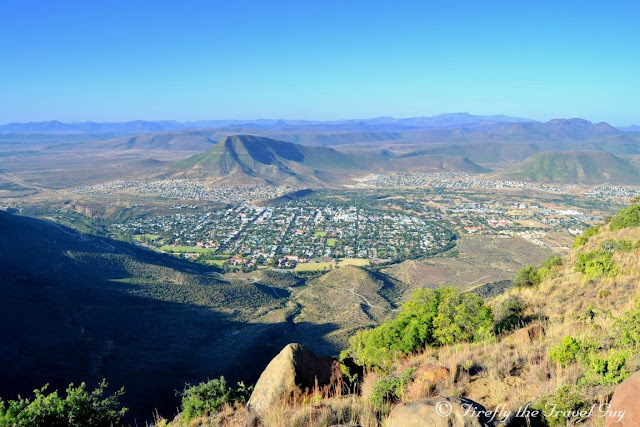 On our long weekend in Graaff-Reinet we spent our Saturday exploring the town's historical heart on foot and kept the Sunday to explore the Camdeboo National Park. The plan was to spend the Sunday morning doing some game viewing, head back to Camdeboo Cottages, where we were staying, for lunch and some R&R before aiming to the Valley late afternoon for sunset on the mountain. The entrance to the game viewing area is just past the turnoff to the Valley of Desolation and takes one straight into a typical Karoo landscape of low Karoo bush and grassland, mountains in the distance and the Nqweba Dam on the other side towards tow, and big skies. Lots of big skies. The park has about 19km of gravel roads which we found to be in a very good condition and no problem for the Polo to navigate. 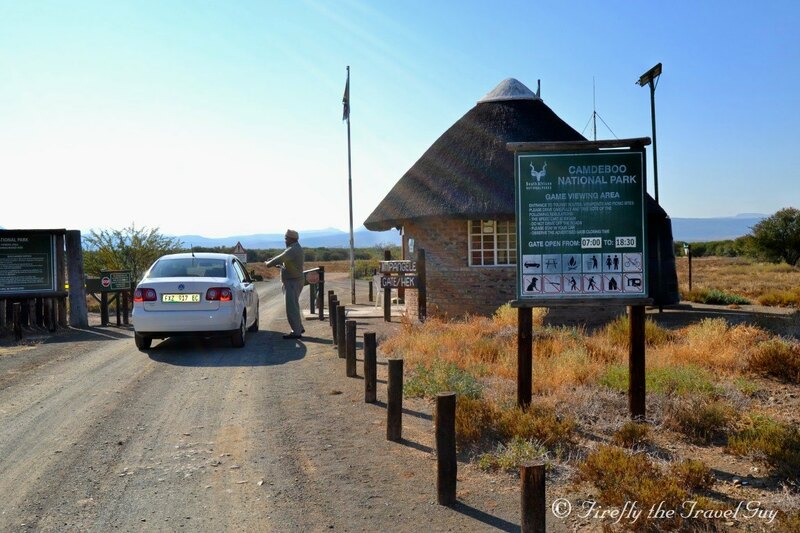 The Camdeboo National Park isn't quite Kruger or Addo, but if you are in the area and enjoy game watching then it's well worth a drive through. 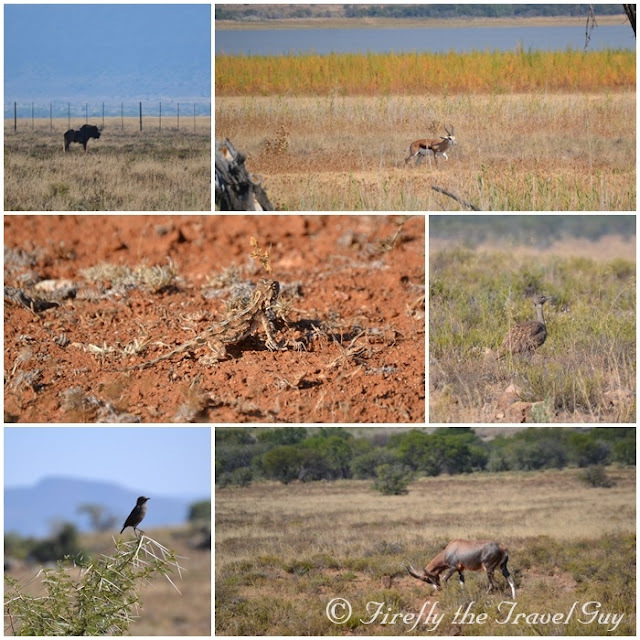 The Game viewing area is home to buffalo, which we unfortunately didn't encounter on this trip, and game species like eland, black wildebeest, gemsbok, red hartebeest, blesbok, springbok and mountain zebra. Friends of ours in the park the same time than us even spotted the elusive rooikat (linx) near one of the waterholes. Our timing seemed to have sucked and we missed it. The park is also home to over 240 listed bird species of which we did spot a few so I imagine the twitchers would love the park. 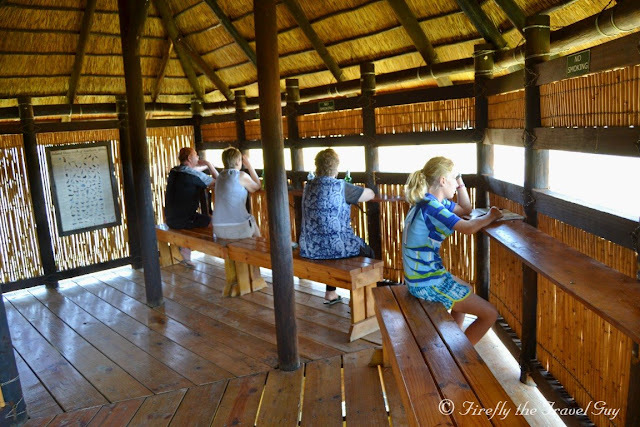 After a quick picnic at the park's picnic site, which we had all to our own, we took a drive to the bird hide next to the Nqweba Dam. The dam level is quite low at the moment which means not a lot of animals or even birds around. It is an awe-inspiring feeling standing there looking at the towering dolerite columns with the vast Karoo stretching out beyond. The dolerite pillars rise up to a height of up to 120 meters and were formed by volcanic and erosive forces over a period of 200 million years. It's hard to explain the beauty of the place and not everybody who visits "gets it", but the Valley of Desolation is a truly special place. I made sure we got there early enough to go for a walk along the Crag Lizard Trail, a 1,5 km sircular trail that shouldn't take you more than about 45 minutes to walk. I want to say the only reason I did it was to go and find the Geocache located just beyond the turning point, but for the first time I got to see more of the Valley of Desolation and some of the further columns which you don't get to see from the main view point. We made it back just in time for the sun to start setting and found that it was disappearing behind the mountain and not over the valley as it does in summer. Darn! 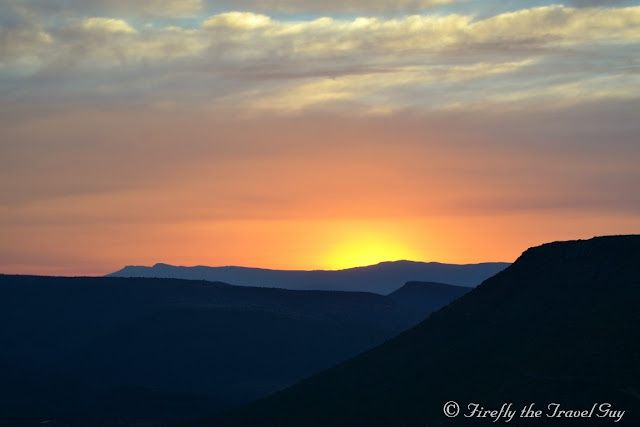 We quickly hopped back in the car and made our way a bit down the mountain to an alternative lookout point I was told about on my last visit, making it just in time as the sun disappeared over the distant mountains. 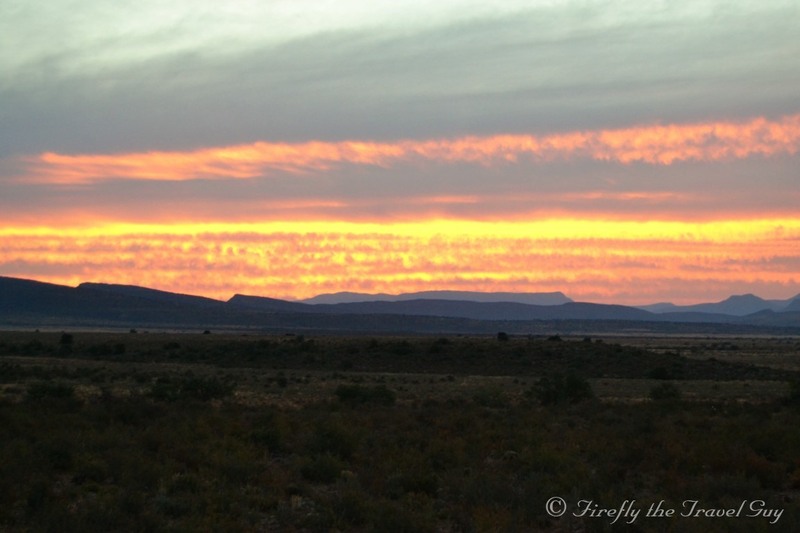 And with that sunset our long weekend in the Gem of the Karoo also came to an end. So what do we take home from the weekend? That Graaff-Reinet is the perfect weekend destination for people living in the Eastern Cape with a variety of historic and natural attractions to keep you busy with during your stay. I also came to the conclusion that people from the interior passing through and heading to the coast and don't realise what they are missing. 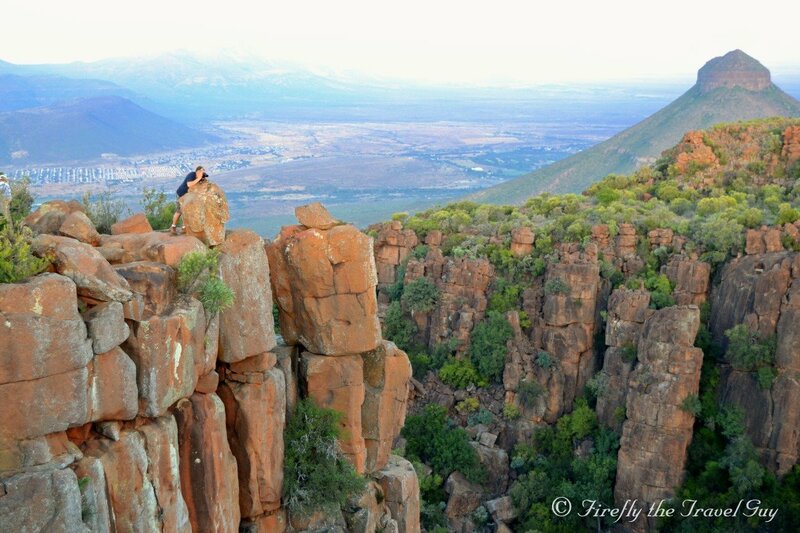 But that really goes for anybody who hasn't had the opportunity to explore Graaff-Reinet and the Camdeboo National Park. History buffs totally love Graaff-Reinet, what with it being the oldest town in the Eastern Cape (fourth oldest in South Africa) with about 220 listed historical buildings. Best of all, you can see just about all the best ones on a relatively short walk around town. And obviously, that is what we did otherwise I wouldn't be writing about it. We parked our car in front of the Graaff-Reinet Tourism office, grabbed a map from the friendly staff in the office and set off up the road towards the church with our first stop being Auty Ira's Antique shop and the oldest cake in South Africa. 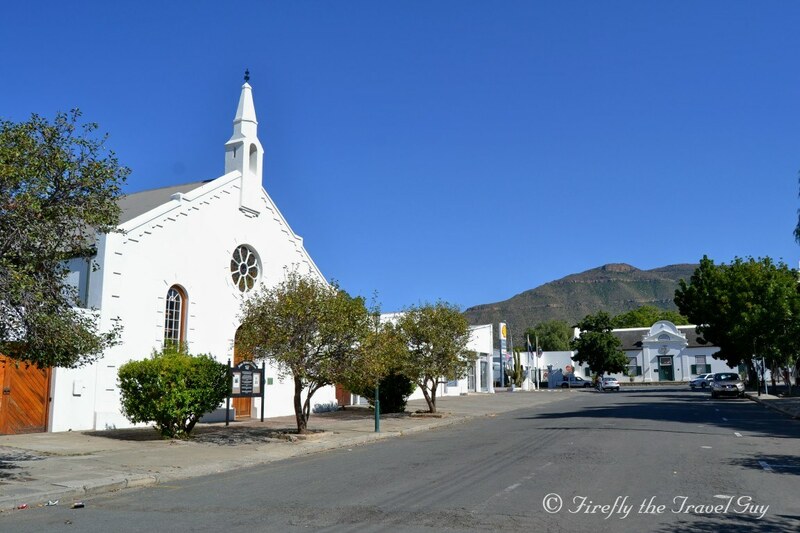 Next up is the imposing Groot Kerk (Dutch Reformed Church) at the top of the main road. The church was built between 1886 and 1887 with the design based on the lines of Salisbury Cathedral in England. Stone to build the church was obtained locally. The church seats 1,250 people and has a steeple of just over 45 meters high. An interesting feature of the church is that it has a chimney, not something you see every day. The next stop right behind the Groot Kerk is the Victoria Hall and War Memorial. 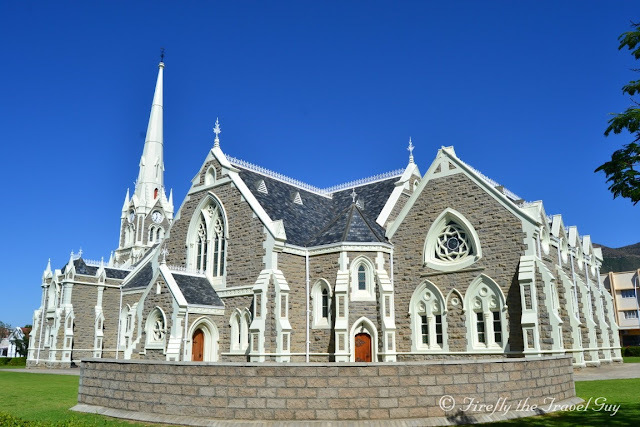 The Victoria Hall is the "new" Graaff-Reinet town hall and was built in 1910. In front of the Town Hall in the Mayor's Garden stands the "Victory Peace Angel", a war memorial erected after the First World War to honour the gallant Graaff-Reinet men who had lost their lives in the war. Graaff-Reinet boasts a number of very good museums representing the town's history, most of them housed in historic Cape Dutch buildings. 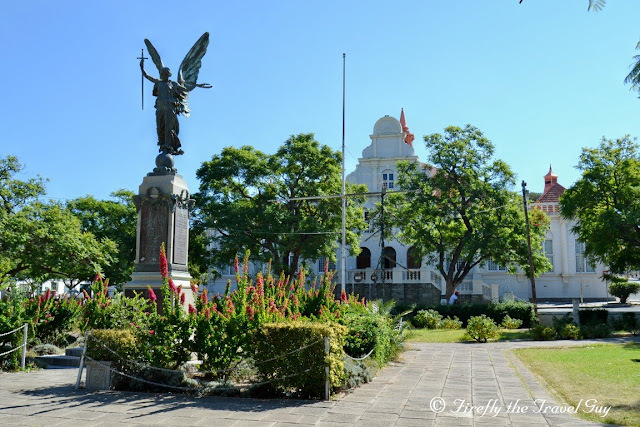 These museums include the Urquhart House Museum (built somewhere between 1806 and 1821), Old Library Museum (built in the mid 1800's) and the Old Residency Museum (built somewhere between 1819 to 1831) and were all along the circle route we walked through town. 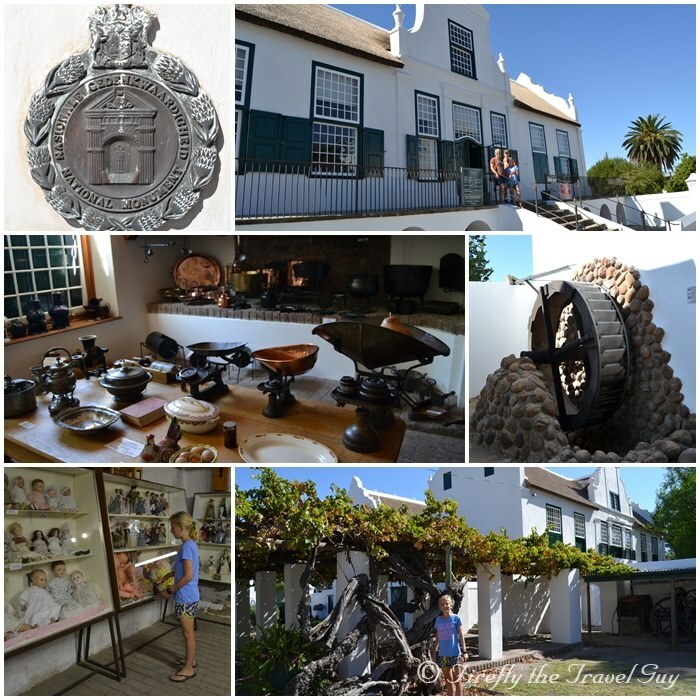 Because we had the KidZ with us and didn't want to end up with two bored whiny teenagers, we decided to only go to Graaff-Reinet's flagship museum, Reinet House. The museum building used to be the Dutch Reformed Church parsonage and was built in 1812. 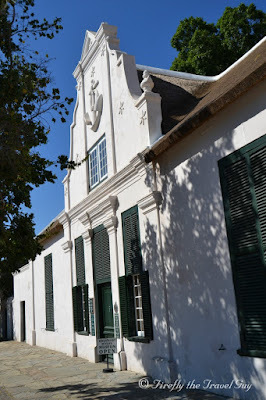 The typical Cape Dutch H-style building was home over the years to Rev Andrew Murray and his son Charles until his death in 1904 before it became a boarding establishment for girls wishing to train as teachers and renamed Reinet House. The museum was established in the 1950's and houses a fine array of period furniture and kitchen utensils, a doll collection, medical and dental collection, haberdashery and clothing collection, wagon and transport collection as well as a blacksmith collection. The Mill House with a working water wheel was under restoration when we were there so unfortunately I couldn't show the KidZ how it works. In the back garden of the museum is an old Black Acorn vine that was planted in 1870 by Charles Murray. A big piece of it had to be cut away some time ago due to fungal rot but the plant still survives. The last stretch of our walk took us up Parsonage Street past the John Rupert Little Theatre (originally the church of the London Missionary Society) and to the Drostdy Hotel on the main road. The hotel is located in what used to be the office and residence of the local landdrost/magistrate. The building was built in 1804 and first became a hotel as early as 1878. These days the Drostdy Hotel is a five-star hotel with accommodation in the adjacent Stretch’s Court. By now the KidZ had enough of walking although we literally only walked around one big block and it was time to head to the car that was now just down the road again. 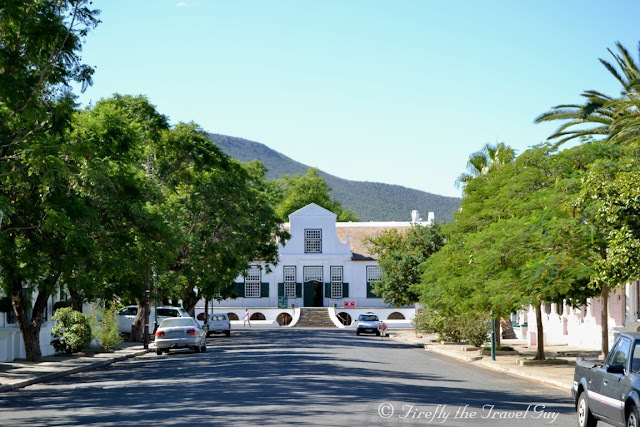 Walking around Graaff-Reinet and visiting all these magnificent historic buildings one is grateful that there are still people out there that care for the history and heritage of towns like this. Getting lost somewhere doesn't always have to mean you don't know where you are. Sometimes you are so in awe of where you are that you lose track of time and literally get lost in your own mind. 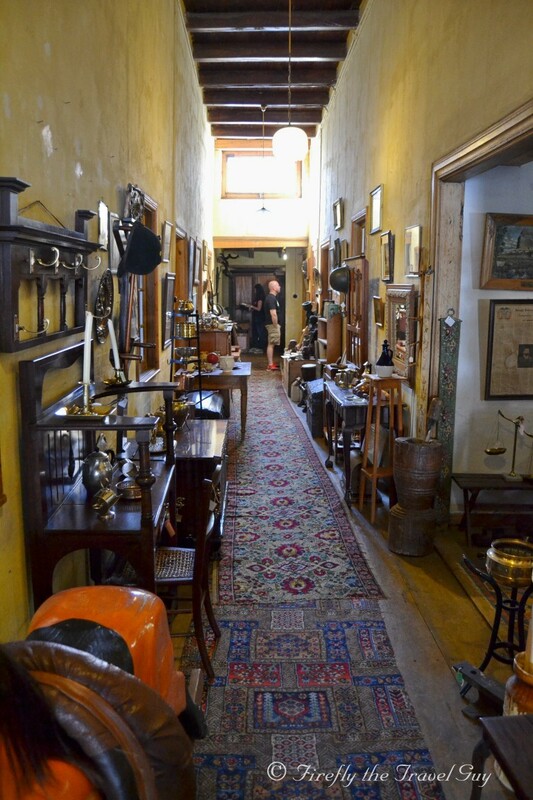 While exploring Ira's Antique Shop in Graaff-Reinet while looking for the oldest cake in South Africa, I spotted this guy down the passage looking totally lost in himself. 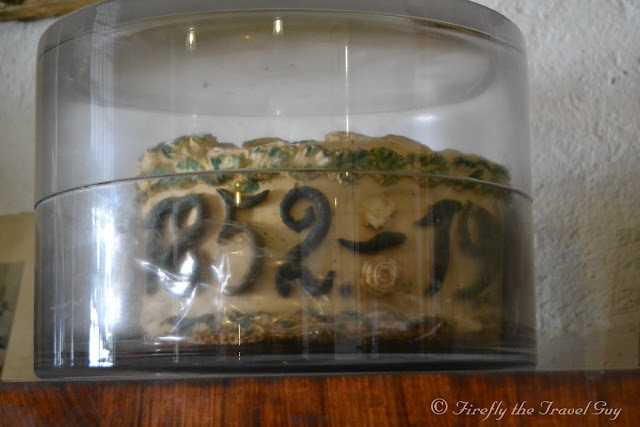 One of the first things Karoo Girl asked me when she heard I was going to visit her home town of Graaff-Reinet, was if I was going to go and see the oldest cake in the country. 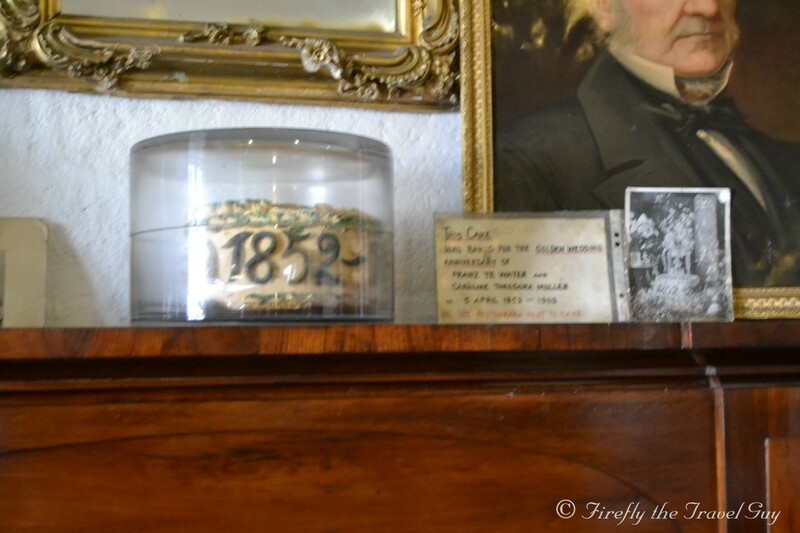 Now I know most of Graaff-Reinet's attractions, but the cake was a first for me. She directed me to aunty Ira's Antique Shop next to the Graaff-Reinet Tourism info office and that is where we headed on the Saturday morning of our visit before taking a walk around town. Once there we took a slow walk through the antique store and marveled at all the beautiful pieces and nic nacs before I found the cake on the mantle piece in one of the front rooms. Nothing spectacular till you look at the date 1902, making it 115 years old (this being 2017), making it only four years younger than the oldest cake in the world. 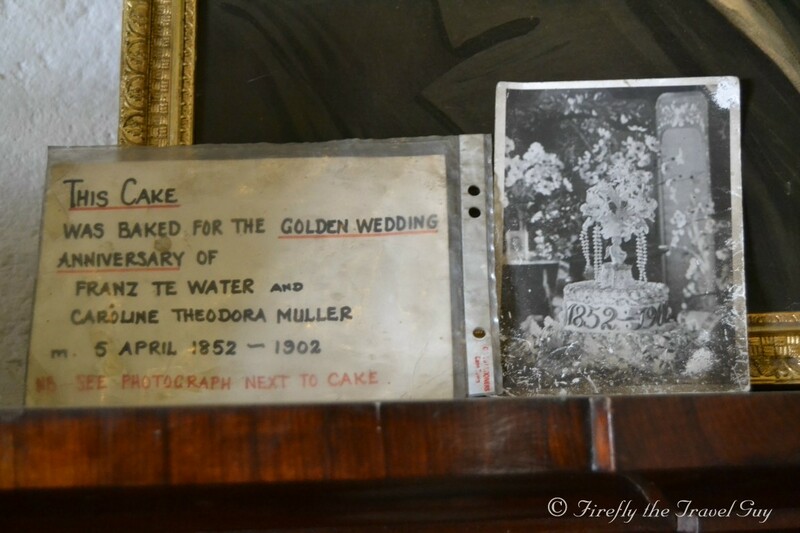 The cake was baked for the Golden Wedding Anniversary of Franz Te Water and Caroline Theodora Muller who got married on 5 April 1852 with the cake being baked in 1902. The fancy decorations that was originally on the cake, as per the photo, is no more, but the cake is intact. Apparently it was found in an attic in town. Unfortunately Karoo Girl wasn't with me to tell the whole story, which she relates as part of her walking tour of the town. The cake isn't something that is written about in guide books or tourism brochures, and the kids just had a quick look before heading outside, but I found it really interesting and definitely part of the town's rich heritage. It just shows that there are often so much more to discover in a place than what is in the guide books. Look around, explore and investigate. It's always worth it. 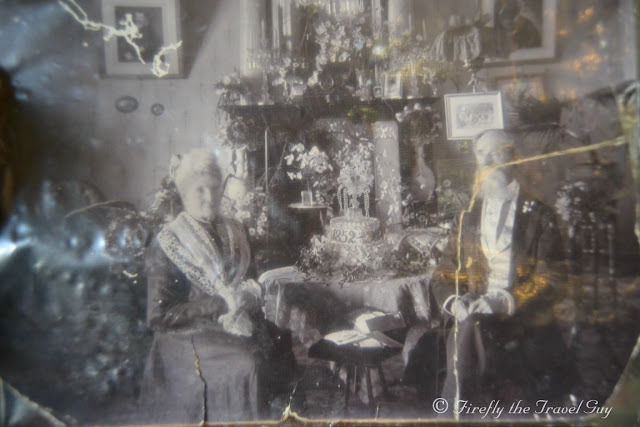 His first wife was Jacomina Jacoba Jansen van Rensburg, born in Graaff-Reinet 3 December 1814, they got married on 7 December 1848, but she passed away aged 36 in 1851. He then married Carolina Theodora Muller on 5 April 1852. She was born in March 1828 in Beaufort West and passed away 1 June 1904 in Graaff-Reinet aged 76. I have always had a love for cacti and succulents. Perhaps because there are so many different species, because they often surprise you with the most beautiful little flowers or because they don't need much looking after or water. 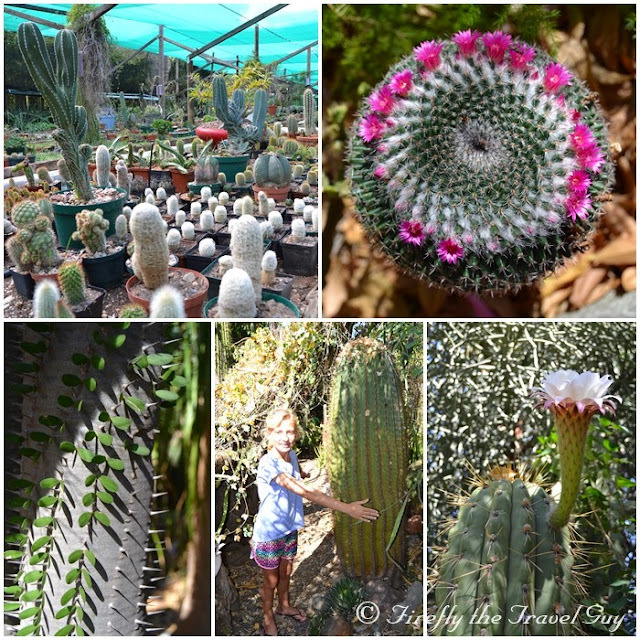 But nothing I knew about succulents could prepare me for what I encountered at the Obesa Cactus Nursery in Graaff-Reinet. 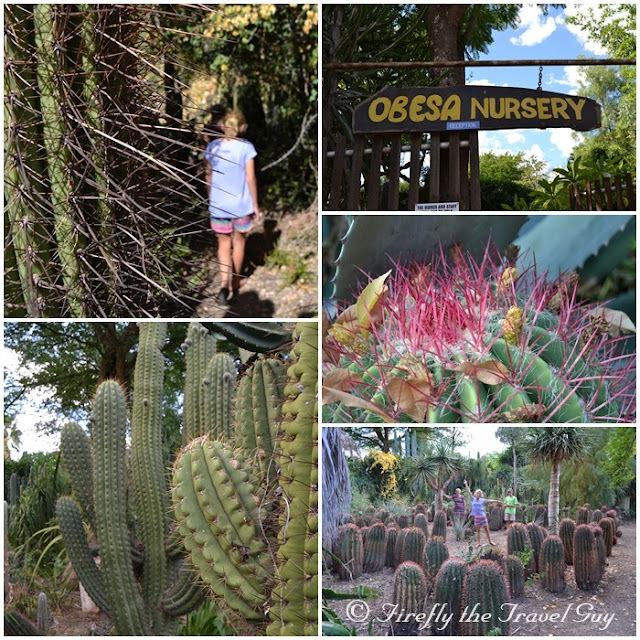 We were in town for a long weekend and had a couple of hours on our hands to explore, so when the receptionist at the guesthouse we were staying recommended Obesa I knew we were in for a prickly experience. Coming around the corner it's hard to miss Obesa. The succulents are all over... the yard... the building... the fence... along the pavement... It's really hard to miss. So is the sign on the gate stating that American visitors aren't welcome. Clearly the owner isn't a Donald Trump fan. So if you're a Yank looking to stop by, just don't say much. Obesa was started in 1970 as a hobby garden, grew up and then went into overdrive. Today it boasts over 7 000 species of plants, raises 35 000 odd plants every year, and stocks well over 2 million. Definitely not quite just a hobby anymore. Chatting to owner Johan he was telling me that most of their succulents are exported with the majority going to Europe. Obesa is basically made up of two sections. Firstly there is the garden and then the nursery. It was in the garden where we kicked off our visit. Johan pointed us in the general direction and from there we followed the paths and signs. It's in this garden where cactii growing up to around 8 meters high will take your breath away. Definitely not your typical succulent garden at home. I didn't know where to point my camera. Problem is showing the scale of these plants, some of which is up to 45 years old already. I did try a couple of times to get Miggie to stand by them for scale but she was a bit careful for those big thorns reaching out at her. The nursery itself is huge and if you're a succulent lover then you better come with you wallet well stocked otherwise don't even go there. With us it was a case of "I want one of those, and one of those, one of those and definitely one of those..." And anything you need to know, just ask Johan. He does come across as very direct and not everybody likes that, but the man knows his succulents. That is for sure. 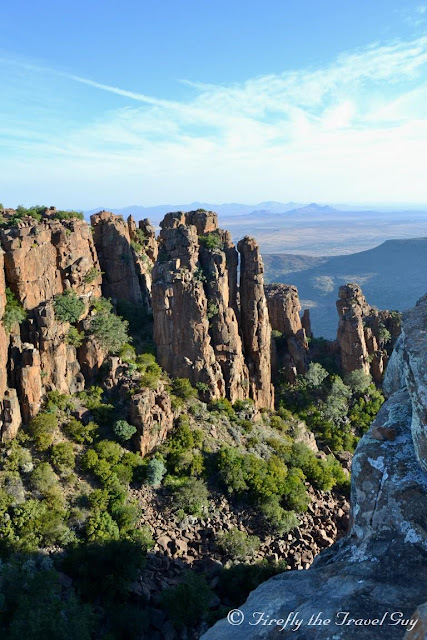 Graaff-Reinet has so many treasures to discover ranging from the Valley of Desolation to the many museums in town, but do open up an hour or so in your itinerary and pop by Obesa. It's perhaps not everybody's thing, but if you like to garden, it will be worth it. Graaff-Reinet in the Karoo Heartland is often referred to as the Gem of the Karoo. Spending a long weekend in the town just again proved to me that this gem isn't one buried deep under ground somewhere but rather has been unearthed and is mesmerizing those that get to visit it. Located in a horseshoe created by the Sundays River and totally surrounded by the Camdeboo National Park, Graaff-Reinet is situated about three hours north of Port Elizabeth and the perfect long weekend destination or at least a must stop for those on their way from the interior to the coast. 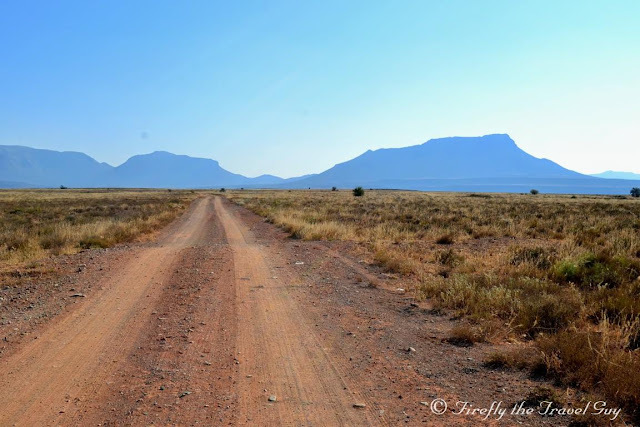 Coming in from the south you pass through typical Karoo Heartland landscape on your way to Graaff-Reinet. Wide open spaces, mountains in the distance, windpompe, Angora goats in the fields - big sky country at its best. Arriving in Graaff-Reinet you immediately know you are in something bigger than a one horse town where the horse is dead. There are more shops than most Karoo towns, more people, more cars and there definitely isn't a tumbleweed blowing down main road on a Saturday afternoon. 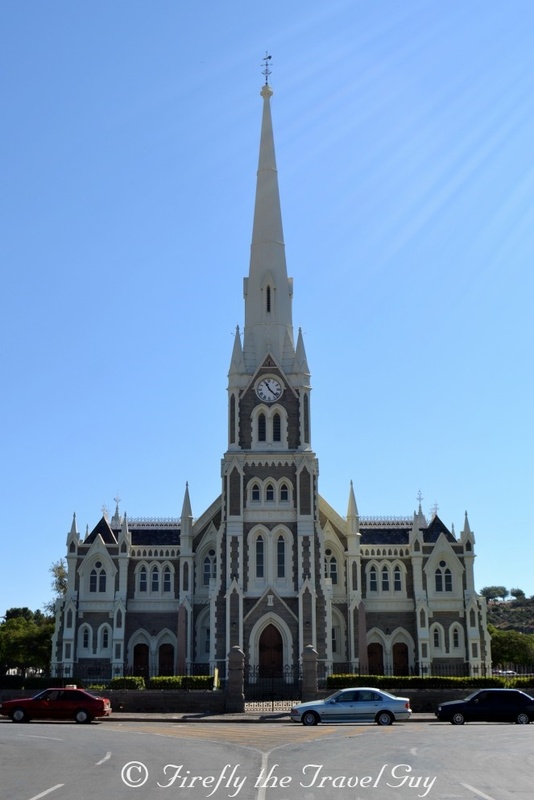 In fact, you know you are in Graaff-Reinet when you get to the top of the main drag and find yourself facing the very impressive Groot Kerk, completed in 1887 and designed based on the Salisbury Cathedral in England. If I'm going to a place I like to know what I'm going to do but also keep enough time aside to explore and discover the things not included in my plans. This trip was no different. Arriving early Friday afternoon we headed straight to Camdeboo Cottages where we were booked in for the weekend, unpacked our stuff and kicked off our shoes. If it was up to the KidZ we would have stayed right there for the whole afternoon for them to watch tv (Chaos Boy) and hit the swimming pool (Miggie). Unfortunately for them, we had other ideas. Having planned a walk through town for Saturday and a visit to the Camdeboo National Park on Sunday, I browsed through the Graaff-Reinet visitor guide to see what we could still do on the Friday and came up with the Obesa Cactus Garden. 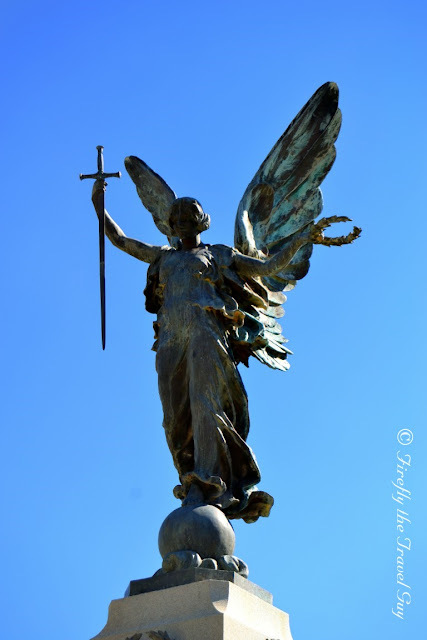 I've been to Graaff-Reinet a few times but have never had the chance to visit Obesa. Word has reached my ears of how big the cacti are but seeing truly is believing. Owner Johan popped his head around the corner when we arrived, probably to make sure we didn't speak in an American accent - referencing a sign at the gate making it clear he doesn't support Donald Trump - and pointed us towards the path through the garden. Obesa is nothing like my little cactus garden at home. They have over 7000 species of plants in the garden and nursery, raise about 35 000 plants every year and stock well over 2 million. Seriously impressive. 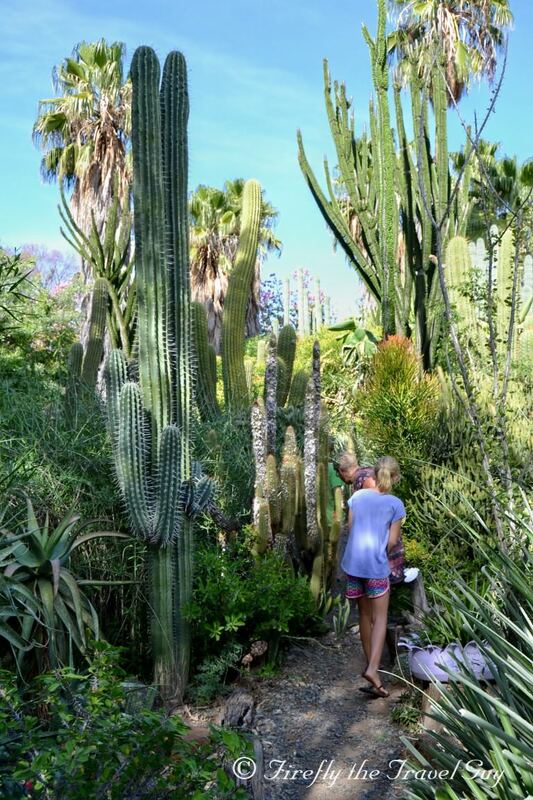 Even more impressive is the size of some of the cacti along the path through the garden. 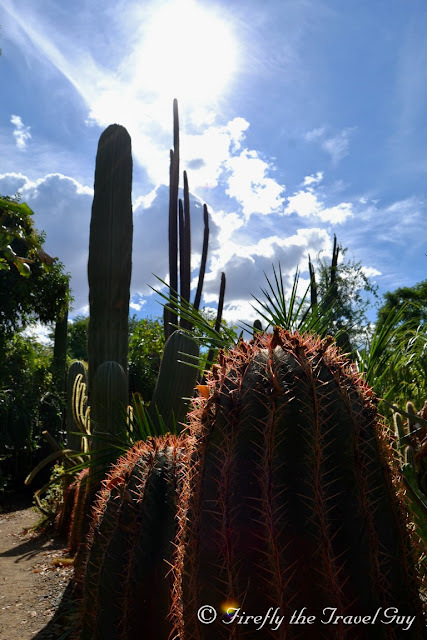 The garden was started in 1970 with some of the cacti literally dwarfing us as we walked past. No kidding. Saturday morning after a quick breakfast it was time to put on the walking shoes and explore Graaff-Reinet's historic heart on foot. The best spot to park your car is right in front of the tourism office where you can grab a map of the town along with any additional information you think you may need. The tourism office is located inside the Old Library Museum which Chaos Boy really enjoyed as they have a very good collection of fossils on display. In addition to a number of museums and Groot Kerk, other historic attractions worth visiting include a number of other churches, the Drostdy Hotel, Victoria Hall - the town's City Hall - and the angel statue War Memorial. In actual fact, Graaff-Reinet has more than 220 heritage buildings, more than any other town in South Africa. Best of all, most of them are all within walking distance from each other. Our first stop though was at the antique shop next to the tourism office. Not to browse or buy antiques but rather to see what is said to be the oldest cake in South Africa. Yes, you heard me right. The oldest cake in the country. The cake was baked in 1902 (making it only four years younger than the oldest cake in the world) for a 50th wedding anniversary and is on display on a mantelpiece along with some original photos. The KidZ weren't really impressed and just wanted to know if you can still eat it, before wandering away again. 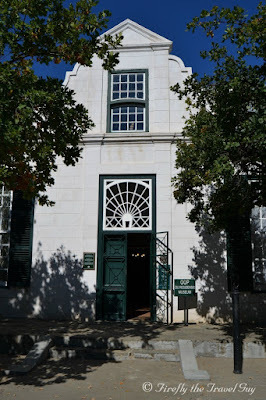 Graaff-Reinet has as much as seven museums (could be six, could be eight, but I counted seven on the Graaff-Reinet Tourism website) and we decided that to keep the KidZ's whining to a minimum, we would only go to another one of them. The obvious choice was Reinet House. 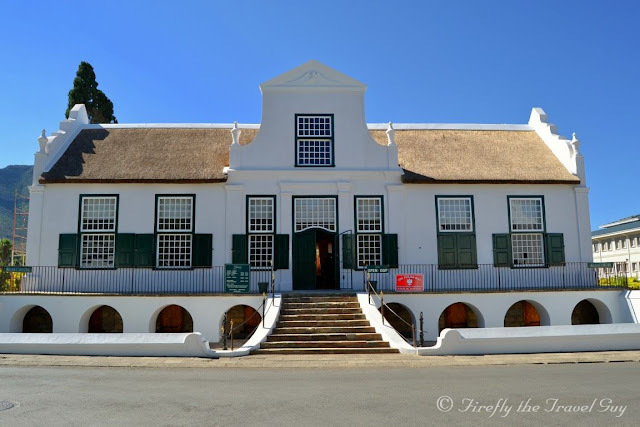 Reinet House is the quintessential Graaff-Reinet museum and is located inside the old Dutch Reformed Church parsonage built in 1812. The museum houses a variety of period furniture and kitchen utensils, a doll collection, medical and dental collection, haberdashery and clothing collection, wagon and transport collection as well as a blacksmith collection. In the backyard there's also a working watermill... Ok, so it wasn't working when we were there as they are busy restoring the machinery. But you know what I mean. Another very interesting feature at Reinet House is the old Black Acorn grape vine in the backyard. 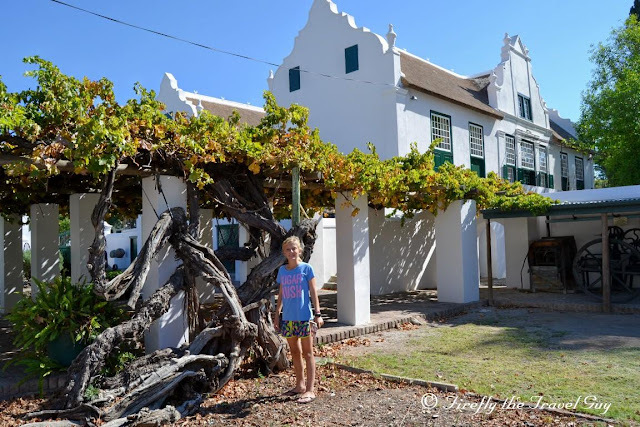 Planted in 1870 by Charles Murray, it is said to be the oldest living grape vine in South Africa. A few years ago the vine got a bad case of fungal rot and a big part of it had to be cut away, but it survived and still persists. 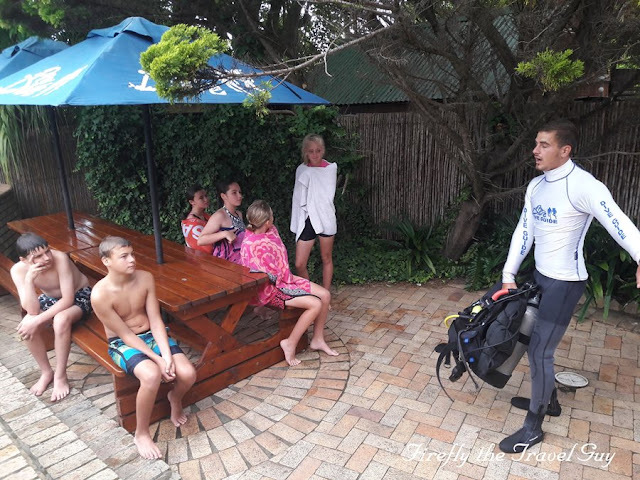 Saturday afternoon we decided to compromise with the KidZ and spent some time around the tv, pool and braai area at Camdeboo Cottages. Just to make sure everybody stayed happy and long faces are kept to a minimum. Sunday morning it was time to hit the outdoors and enjoy nature. The weather was perfect, the sun out but not too warm and we headed out on the R63 past the Nqweba Dam to the Camdeboo National Park's game viewing area. Although the game viewing isn't anywhere close on par to Addo, it's still a great opportunity to spend a morning game viewing. The alternative is to book an evening game drive with oom Buks Marais at Karoopark Guesthouse. We opted for the self drive option though. The park has about 19 km of gravel roads and consts of typical Karoo plains. Other than Cape Buffalo ( x ) , which we unfortunately didn't get to see, the park is also home to eland ✓, black wildebeest ( ✓ ), gemsbok ( ✓ ), red hartebeest ( ✓ ), blesbok ( ✓ ) and springbok ( ✓ ). We also got to spot some Cape mountain zebra ( ✓ ) but even though we were in the park the same time as some friends we didn't get to see the caracal (rooikat) ( x ) they did. The park also boasts a healthy bird list of over 240 bird species. Unfortunately the dam level is quite low at the moment so you don't get very close to the animals on the water's edge while the bird hide was also not that busy on the day. With birds that was. 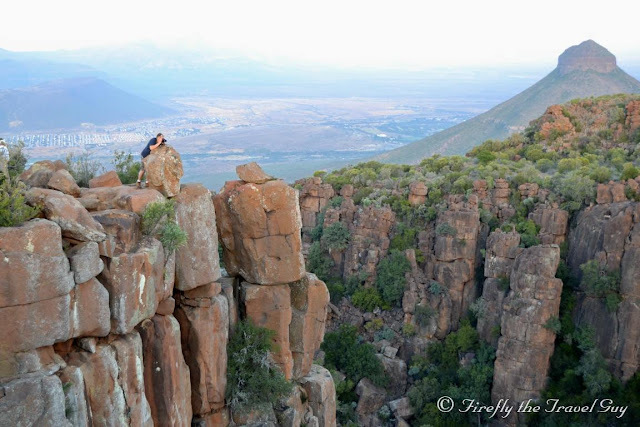 The highlight (and must do) of any visit to Graaff-Reinet is the Valley of Desolation. The best times to be there is early morning or late afternoon around sunset, and we opted for the latter of the two. 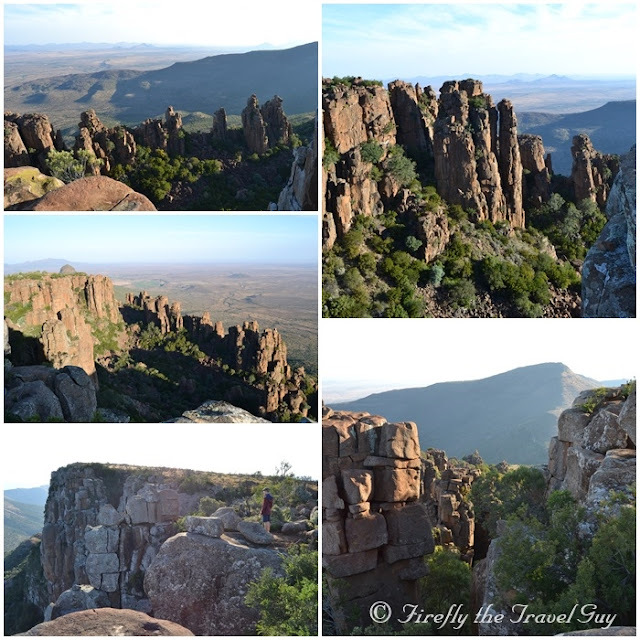 We made sure we arrived nice and early the afternoon to allow some time to do the 1,5 km Crag Lizard Trail which allows for stunning views of the rock formations, the valley and Karoo plains beyond. 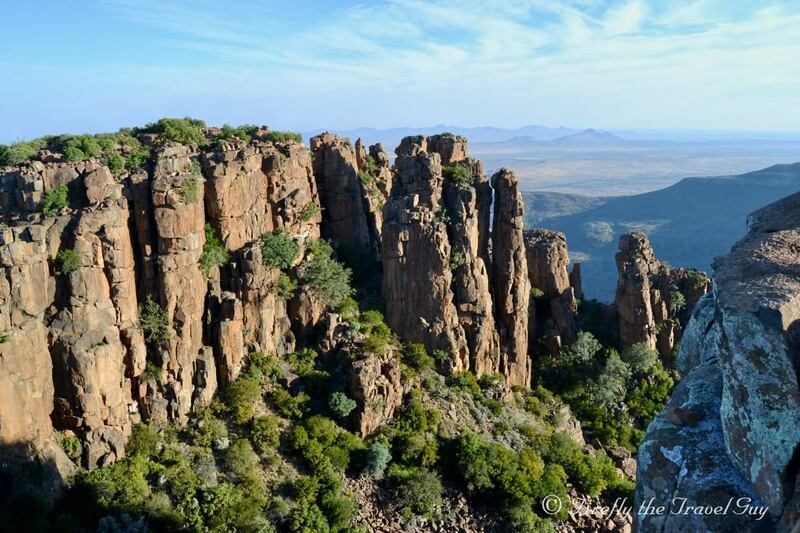 The Valley of Desolation itself truly is one of the iconic Eastern Cape attractions. The basic explanation of what the Valley of Desolation is is that it consist of dolerite pillars rising up to 120 meters from the valley below. The rock formations were formed by volcanic and erosive forces over a period of 200 million years and stand stark against the background of the Karoo plains. This time of year though the sun sets behind the mountain and isn't quite as spectacular as in summer, so after watching it from an alternative view point we headed back down towards town, just in time to see the horizon set ablize as we hit the bottom of the mountain. The perfect end to the perfect long weekend in Graaff-Reinet. Till next time Gem of the Karoo. 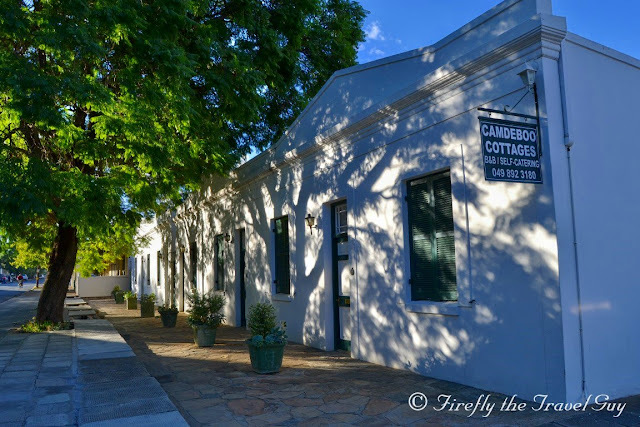 We spent the three nights we were in Graaff-Reinet at Camdeboo Cottages and I really feel we hit the jackpot with this spot. Camdeboo Cottages offer both a Bed and Breakfast as well as a Self Catering option with accommodation offered either in their historic cottages or en-suite bedrooms. 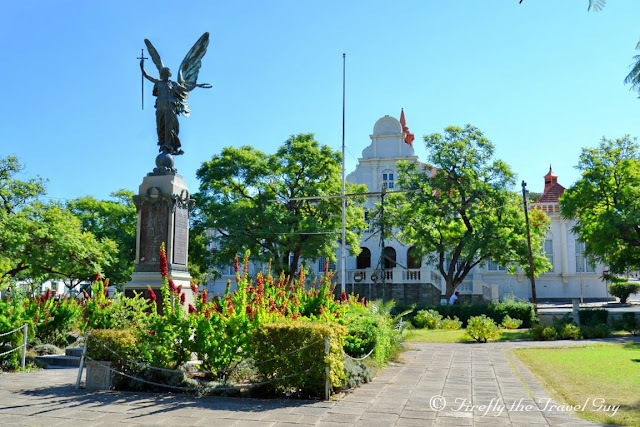 It's also located very close to the centre of town with a few restaurants right around the corner and the closest supermarket only a few blocks away. 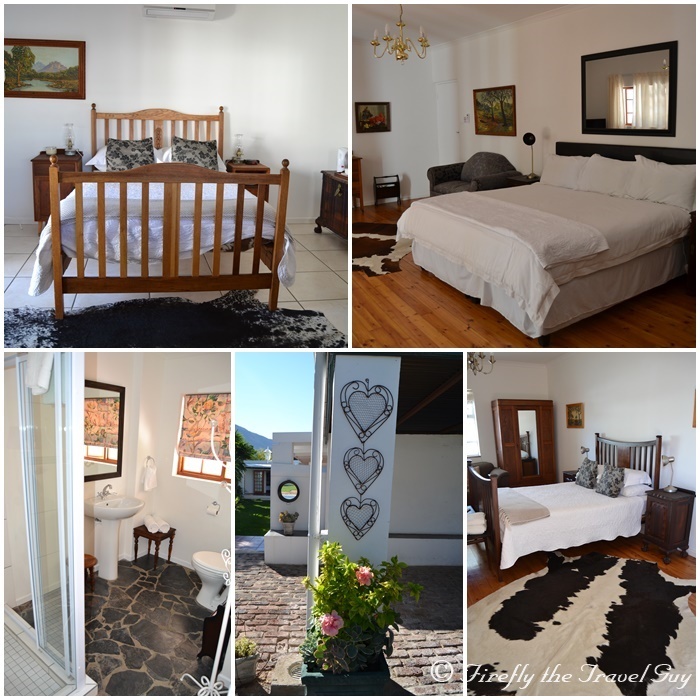 We stayed on one of their nine 19th century Karoo style self-catering cottages with more than enough space for us and the KidZ. The cottages have fully equipped kitchens so we did our own thing food-wise, Chaos Boy could watching TV while Miggie and I tried to play cricket on the cobblestone courtyard behind the cottages. That didn't work out very well, but it does offer safe parking under carports and behind a locked gate. As I've mentioned, Camdeboo Cottages also offer breakfast as well as dinner, but we opted to braai every evening at one of the braai spots next to the swimming pool. Literally 25 meters from our cottage. We sommer ate right there next to the pool and I just had to smile every time another guest heading to dinner walked past and sniffed the air. Nothing like the smell of braaivleis. 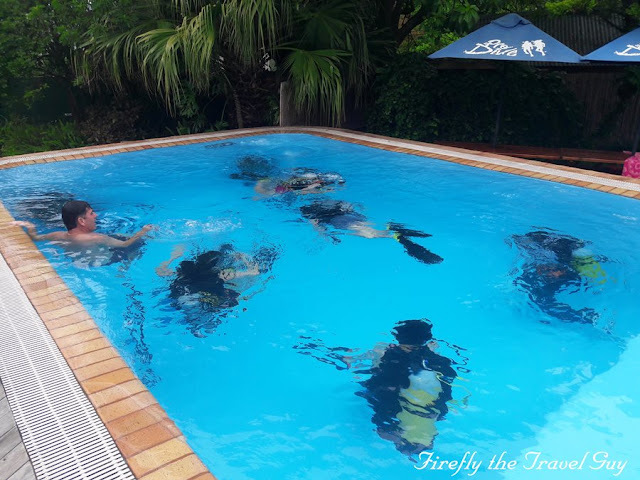 Although Miggie did try out the swimming pool the weather was a tad chilly but it would be a great spot to cool down on one of those hot summer days in the Karoo. 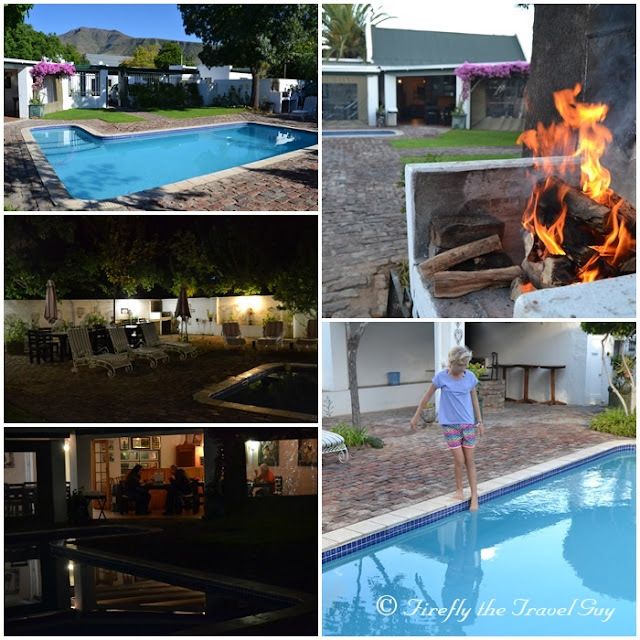 Next time we visit Graaff-Reinet as a family I know where we'll be booking again.